Following their success in the 21 Jump Street program, Schmidt (Jonah Hill) and Jenko (Channing Tatum) are on to their next assignment. With how well they were able to solve the high school case, they are given the exact same case, only this time, it is at a college. Since they did so well the first time out, they are instructed to follow the same formula they used before. The Koreans bought the church at 21 Jump Street, so they moved to a new, more expensive, more high-tech location at the church across the street. 22 Jump Street. This time, the drug Jenko and Schmidt are looking for is called WhyPhy (pronounced “wifi”). It causes whoever takes it to become incredibly focused for 4 hours, and then want to party for 4 hours. One girl at the college died from taking it. The only lead is a photo of the girl who died getting the drug from a guy with a fairly distinct tattoo. Whenever you have a surprise hit, like 21 Jump Street, you know they are going to do a sequel. After seeing the first movie, which is hilarious, I was nervous about how a sequel would turn out. Usually, these types of sequels go too over the top and end up falling flat on their faces. 22 Jump Street doesn’t fall victim to that. It is smart and funny. The jokes come non-stop, just giving you enough time to catch your breath before they fire again. Channing Tatum and Jonah Hill are back and have the same amazing chemistry as they had in the original. I am still surprised at how well Channing handles a comedy like this. His timing is perfect. And he and Jonah complement each other perfectly. This movie focuses more on the relationship between Jenko and Schmidt, and the different stages they go through – separation, jealousy, insecurity. It plays their relationship as more of a romantic relationship than a professional relationship. At one point, they are even discussing how they feel about their “partner.” It works well as a joke, even if it does get repeated frequently throughout the movie. 22 Jump Street is probably the most self-referential film I have ever seen. Even more so than 21 Jump Street. There are inside jokes after inside jokes poking fun at everything from the budget to the recycling of the exact same plot. At no point in the film do they let you forget that it is a sequel that probably shouldn’t have been made. Which I have to disagree with. Sure, it may not be quite as funny as the original, but it definitely holds its own. Of course, some of the favorites from 21 are back. Nick Offerman, Rob Riggle, and Dave Franco. They all serve minor roles, but their presence is really there just to give a nod to 21. And those moments work. Ice Cube is given more to do this film as Captain Dickson. He is also much funnier in this movie than the last. 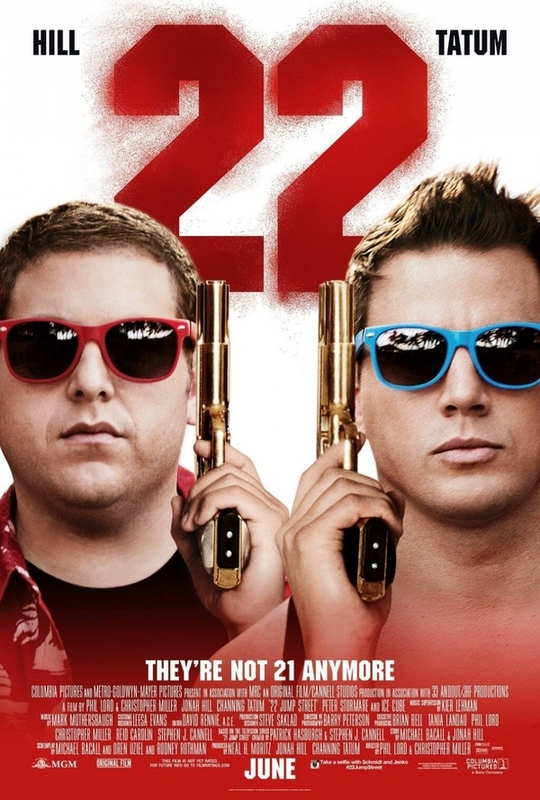 If you were a fan at all of 21 Jump Street, you will definitely want to see 22 Jump Street, even if it is exactly like the first.If you haven’t seen 21, first of all, why not? Secondly, don’t worry. Just like the tv show, they open the movie with a “Previously on 21 Jump Street” that will get you up to speed. It is a nice touch giving a nod to its roots. Make sure you stick around for the credits. The closing sequence is probably one of the better credits scenes I can remember. There is also a quick scene at the end of the credits that is good for a quick laugh. I don’t know if Jenko and Schmidt will end up back across the street at 23 Jump Street, but they have no shortage of ideas for what the next assignment will be.